Let me begin by saying that olive oil is awesome. Though, please, eat it straight off the spoon only in the most desperate of times. And it is heart healthy. So people use it to cook everything and ignore all the other oils. Olive oil section = the cool kids table. In the U.S., sales of olive oil surpassed corn oil in the ’90s, and they have increased in the last decade by more than 350%. It is perfect for vinaigrette. You can drizzle it on top of almost anything as a finishing touch. Left: Ethereally Smooth Hummus. Recipe here. Right: Spaghetti Aglio, Olio, e Peperoncino. Recipe here. It makes lemon cake taste more delicious than butter ever could. Subjective, I’ll admit. Lemon Olive Oil Cake, recipe here. And it is rivaled only by butter as bread’s main hang. The thing is, you shouldn’t be using it for EVERYTHING. Compared with other vegetable oils, olive oil has a pretty low smoke point. Crazy, right? Note: High-quality (read: expensive) extra-virgin olive oils, as well as very refined olive oil, have a higher smoke point, around 400ºF. Smoke point = How hot something can get before it starts to smoke, burn, and eventually catch fire. If oil gets heated above its smoke point, you shouldn’t eat it, or any of the food that was cooked in it. Because not only will it taste bad, it will also be really bad for you. When oil gets heated beyond its smoke point, it starts to break down chemically. It loses most of its antioxidants, releases toxic chemicals in the form of smoke, and becomes filled with carcinogenic free radicals. SCARY. So as a general rule, cooking over high heat with olive oil is bad news. And most of the stuff you cook should be done over high heat. For example, the point of searing is to get color and caramelization on the outside of a food, which can only be done over high heat. If you try to sear with olive oil, the oil will smoke before it gets hot enough to sear the food. Or, if you roast olive oil-coated vegetables at 425°F, the oil will burn in the oven. Your vegetables will be bitter and carcinogenic. Charred crust? YUM! Gross smoke? BOO. That golden crust is beautiful, and definitely was NOT cooked in olive oil. Doesn’t matter if it’s seared pork chops (left) or seared pork tenderloin (right) — olive oil is not your friend here. Some olive oil would be delicious drizzled on top of this rack of lamb. But for cooking it? Not so much. Seared burgers > Grilled burgers, IMO. Roasting the chicken at 450°F makes the skin crispy and delicious, but it’s way too hot for olive oil. Go ahead and coat vegetables in olive oil if you’re going to roast them in an oven below 400°F. But anything hotter than that and you’ll end up with over-charred, bitter vegetables. Woks are for high-heat cooking, which is awesome because it means your food cooks FAST. Not awesome if you use olive oil and set off the smoke alarm, though. YUMMMMMMMMMMM! There is NO WAY you can do this with olive oil. 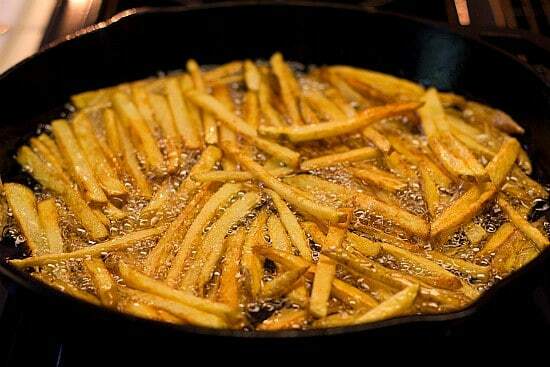 Think about it, have you ever heard of olive oil French fries? No you have not. It is possible that I like hush puppies more than I like regular, living puppies. It is a definite, actually. So what should you use instead? CANOLA OIL. Canola oil is an excellent, widely available alternative to olive oil in high-heat cooking situations. Like olive oil, it is low in saturated fat, and the Food and Drug Administration claims that it may reduce the risk of cardiovascular disease. Unlike olive oil, canola can stand up to high heat (up to 475°F) and has a neutral flavor, making it a good choice for searing or frying. Nut and seed oils also have high smoke points, but have a strong flavor that you may not want in your food. Want more awesome cooking tips? Sign up for the BuzzFeed Food newsletter! I Had No Idea Any Of This Would Work. I Feel Stupid, But Life's About To Get Much Easier.